Not long ago, people young and old lived attuned to one another and to the rhythms of nature. Over the last century or so, life has sped up faster than ever before. People now live most of their over-scheduled lives plugged in, indoors and out of touch. There is a quiet revolution, however, as people begin to yearn for the great outdoors and connection once again. A growing body of research is taking root across the planet as we rediscover what is now aptly called ecotherapy. Ecotherapy exists alongside Nature Deficit Disorder, a phrase coined and spread by Richard Louv. The notion is that our modern lifestyles and our tendency to become driven to distraction keep us from fully experiencing our worlds and our own potential by robbing us of the benefits of time spent in nature. These benefits permeate all levels of our existence from childhood through old age. Being outside helps us recover from mental fatigue and restores our ability to process information, especially when your’re enjoying the natural beauty of Lake Tahoe. By decreasing our mind’s over activity, nature helps our thoughts become clearer, sharper and more creative. Taking easy advantage of these benefits, progressive “forest schools” schedule classes out of doors to enhance student performance, and homes for the elderly utilize horticultural therapy to increase quality of life. Nature even heals us. In the 1980s, Japan began formalizing the practice of “forest bathing,” or shinrin-yoku. Shinrin-yoku is the slow, meditative experience of walking in nature with directed focus on the elements and senses. Studies held in the lab and outdoors, as well as in prisons and hospitals, have discovered nature’s benefits begin immediately and last for several days after exposure.These benefits include: reduced blood pressure, reduced stress levels (as measured in salivary cortisol), improved mood (perhaps owing to a friendly dirt bacteria which causes the brain to produce serotonin), increased energy levels (thanks to trees’ essential oils), and boosted immune systems. The latter occurs because trees give off organic compounds that encourage the body’s production of natural killer cells which fight abnormal cells and speedup recovery time after surgery or illness. 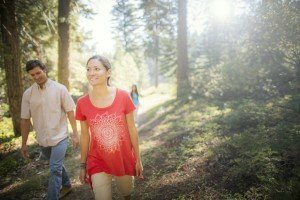 As the studies continue to come out, the facts echo what we already know intuitively: being in nature feels good physically, mentally, emotionally and spiritually. When in nature, the brain quiets down a bit and we become more curious about the world around us. The world, and we, come alive. Ashley A. Cooper is a freelance writer and yoga instructor residing in Truckee, CA.Visitors and locals alike are drawn to Lake Tahoe’s natural beauty, world-class entertainment and year-round activities. Granlibakken, nestled in the trees above Lake Tahoe and steps from Tahoe City, the heart and soul of the area, is the ideal spot for your next retreat, conference, vacation or special event. Check out our calendar for our Wellness events held in the spring, summer and fall. Further Reading: Last Child in the Woods; and The Nature Principle by Richard Louv. This entry was posted in gutenberg, Recreation, Sierra Soul, Uncategorized. Bookmark the permalink.